A busy lifestyle can make it challenging to find time to work out. However, creating a home-gym can make your work easier. The rowing machine is ideal for all fitness levels as well as beginners and those used to working out daily. Various features are available depending on the type of workout, your mobility, and how much you’re willing to spend. Here’s a detailed review of Xebex Air Rower and some mistakes to avoid. ​​The Xebex air rower is a tough gym-built machine perfect for both gym and home users. GetRX’d is the manufacturer of the Xebex rower. With over 30 years of experience in designing and manufacturing cardio equipment, the company is now a renowned brand known for its treadmills, indoor bikes, and other CrossFit-style equipment. Here are some features that make the Xebex unique. Xebex rower has heavy-duty steel, high-grade Aluminum, and quality plastic. Also, its base has steel which keeps the machine well-grounded and sturdy. The rowing machine is a bit heavier than its counterparts are, but its quality makes it durable. Xebex air rower comes with a comfortable. The smooth, and firm rowing stroke that doesn’t have any lag. The ball-bearing rollers provide a trouble-free gliding seat, and the metal rowing chains recoil well. Furthermore, the sear on this rower has thick padding and features rimmed edges. You won’t feel any stiffness or pressure when on the rowing seat. Also, the handle has extra padding which ensures that you get a foam grip. Getting on and off the Xebex rower is a breeze as it has a seat level of 21”.This feature is helpful for people operating the machine for therapeutic purposes. You can now extend your workouts without worrying about soreness. The Xebex rower is easy to store as all you have to do is fold it in half by pulling out the locking pin. The seat rail goes up, and you can roll on its inbuilt caster wheels. You can use one hand to push the Xebex rower into the desired location to save space. However, the machine is massive, and it would be inconvenient to move the rower up and down the stairs or to a different location like the garage. The Xebex air rower performs as well as its construction. It has a monitor that tracks both calories and distance. The Xebex air rower retails at $729. After reading every review available on Xebex air rower, there are few complaints about this rowing model. Many consumers love the Xebex Rower because of its low price and excellent resistance. Also, they enjoyed the taller seat height, easy-fold storage, and gifts. A few people complained about the use of plastic in the rower. Parts like the handle holder, the handle, and the back have a plastic material, and some users feel that the company would have done better. Although these parts don’t determine the machine’s durability or affect its function, users felt that these areas fell short. Some users also disliked how the monitor tracks calories. The Xebex rower is one of the rowing machines in the market. Here’s how it compares with other rowers in the market. Designed to fit most users: 14-inch seat height, adjustable footrests and ergonomic handle. Concept2 is a favorite rowing machine and comes with two models. Model D and Model E. This rowing machine provides excellent resistance like Xebex Air Rower as they both use the same fan flywheel. Both Concept2 and Xebex have damper settings which control the amount of air that goes through the flywheel while rowing. Users can enjoy a lighter or heavier feeling of rowing without any change in the resistance. The Concept2 has a powerful monitor that people refer to as a mini computer as it can calculate the number of points and connect to other devices. 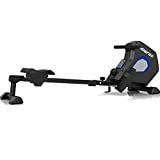 However, Xebex air rower has a primary monitor that lacks tracking features like average strokes per minute, pace boar, projected distance, split meters, and more. Drag factor which is the calculation of the deceleration rate of your flywheel for each stroke is another concern when comparing these two rowing machines. You can view the drag factor on a Concept2 before a rowing session. The damper allows you to adjust the drag factor. The Xebex Air Rower doesn’t have a viewable drag factor setting. Also, the accuracy of the Xebex rower is a significant concern. However, a few people do not care about data accuracy, and this feature is not a big deal. When it comes to price, Xebex Air Rower costs less than the Concept3. Also, it has lots of gifts, something Concept2 lacks. Some free items include a gym sled, resistance bands, a slam ball, wall ball, and a speed rope. Sunny Health rowing machines are budget-friendly, and the SF-RW5515 doesn’t disappoint, the rowing machine offers an excellent range of resistance modes and it doesn’t need regular power to its magnet. Also, it has an all-steel construction which gives it a solid feel. However, unlike the Xebex which can accommodate an overweight person, the Sunny Health and Fitness Rower can only accommodate up to 300 pounds. Its advantage over the Xebex is that it’s simple to assemble and easy to store and transport the rowing machine. Its magnetic resistance gives you a consistent rowing performance, and you can change the resistance levels by the dial. 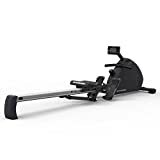 Xebex rowing machine performs better than the Sunny health and fitness rowing machine due to its comfort, quality components, and high maximum user weight. While most rowing machines are suitable for the average user, the Life core rowing machine changes this as its ideal for dedicated fitness enthusiasts. It has a maximum weight allowance of 600 pounds, making it an excellent option for the overweight people. Like Xebec. Life core rowing machine has strong resistance at its higher settings. You can enjoy an excellent service for an extended period than rowing machines with lower maximum intensity. Its monitor is backlit and is easy to read and use. On the downside, Life core rowing machine is noisy, and the footrest can be uncomfortable for people in extended rowing workouts as it can pinch at the heels. Also, it\s more expensive than the Xebec Air Rower. The Merax indoor rowing machine works on magnetic resistance which you can change for up to 8 levels of intensity. Also, it has a resistance knob that allows you to workout based on your body requirements, a feature that lacks in the Xebex air rower. It has double padded seats for ultimate comfort and back support, something that Xebec takes into consideration in its design. Furthermore, it has an LCD monitor which displays your workout information like calories burnt, time spent, rowing count, and more. 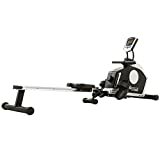 The Xebex air rower can sometimes get noisy, but Merax indoor rowing machine has a magnetic flywheel which works efficiently and quietly based on the chosen resistance level. If space is an issue, you’ll love the Merax rowing machine as it’s foldable and portable. However, it can only support a maximum weight of 264 pounds, which makes it unsuitable for the overweight. The WaterRower Natural rowing machine combines performance with quality build and aesthetics. Being a hardwood product means less noise and an added stability. Unlike Xebex air rower that has an air flywheel, the WaterRower machine has a patented water flywheel which gives it a smooth operation. Also, a water-resistant rowing machine enables you to select the desired level of intensity because water resistance goes up with speed and rowing effort. It’s one of the rowing machines with close simulation on the water race boats. Schwinn is a renowned brand that has been around from 1965.The company is famous for its home fitness machines, and the Crewmaster doesn’t disappoint. It’s ergonomic and made from durable materials. Also, it has a magnetic resistance design like the Xebex rowing machine. However, this machine has ten magnetic resistance levels and an inbuilt monitor that tracks your calories, distance, strokes, and display time, something missing in the Xebex rowing machine. Another similarity between this two is the padded seat and ergonomic handles. Crewmaster rowing machine also has an over-sized rail for a smooth glide and added stability. It has a wireless heart monitoring system that is not available on the Xebex machine. The Schwinn rowing machine comes with a ten-year warranty while Xebex only comes with a three-year warranty. One major downside with the Crewmaster rowing machine is that it’s not foldable. Furthermore, it doesn’t have advanced features like premium rowing machines. Some users have reported inaccuracy on the pulse display on the LCD monitor. The rowing machine is ideal for home use, like the Xebex rowing machine. However, the folding magnetic resistance rower is easy to use and assemble and provides a quiet, yet even row. 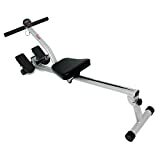 It also has a padded handle, a contoured seat for added comfort, and foot pedals with wide Velcro straps to ease any joint stress when you’re working out. You can choose between eight levels of tension to boost your heart rate and challenge your resistance levels. Nonetheless, this type of rowing machine is only suitable for beginners and those on an intermediate level. Also, it can only accommodate a maximum height of 6’2”. The straps and foot pedals are of a low quality which could create the need for readjustment and may cause slippage. The magnetic resistance rowing machine is an excellent machine if you need to work each muscle group while building flexibility and strength. It’s simple and has a compact design well-suited for a home gym. Although rowing machines are excellent workout equipment, they can cause body pain because of common errors which may include the wrong setting. Here are some tips on what to avoid to build some muscles and increase your strength in the long run. If you’re a beginner, it’s best to watch videos or consult a trainer on how to row the machines properly to achieve the benefits it provides. The trick is to seat in the right posture and push the rower with your legs as you pill it with your arms. Ensure you’re comfortable while doing this. You need to keep the intensity low while getting started and push this to a five during the warm-up session. If your body posture adjusts to this setting, you can switch the resistance levels for an intense work out based on your preferences. Most people only use one part of their body while operating the rowing machine which is a mistake that can lead to injuries. Make sure that you use both the upper and lower body while operating the rowing machine. Doing this gives you a complete workout and helps you build endurance during the workout session. Working out with a high resistance level than you’re capable of only leads to muscle rupture and body pain. Choose the proper resistance level while working out to avoid this type of injuries. Avoid going hard, instead start slow and increase the resistance to promote muscle growth. The Xebex Air Rower is a quality machine made from durable materials. Although the rower is sturdy enough for commercial use, it’s also perfect for home users which is a significant plus. 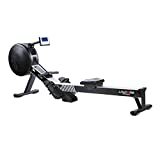 Also, the rower has a solid warranty and comes with a bonus conditioning pack on Amazon that is over $100. For its price, you can be sure of a quality machine that is durable than other rowers in the market.